Kingsway Buildings, University of Chester CH2 2LB. Imagine a time when immigration was seen as a potential source of radicalism and sectors of the population were regarded as a dire threat to the State. At the start of the cold war in the USA, the communist threat was perceived as imminent and even Hollywood stars were not above suspicion. McCarthyism is an exhibition of paintings by David Gledhill based on American press photographs of the ‘House Un-American Activities Committee’ hearings of the 1940’s and 50’s. The committee was dedicated to the exposure and elimination of the communist threat in every branch of American life. Trades unionists, teachers, secretaries, janitors, artists, actors, writers and directors were amongst those forced out of their jobs. Senator Joseph McCarthy of Wisconsin did not sit on the committee himself, but his virulently anti-communist speeches of the early 1950’s gave rise to the term ‘McCarthyism’ which has become synonymous with the ‘red scare’ of the post-war years in the USA. The source photographs used for the project were bought online from Detroit and Chicago newspaper archives using the search terms ‘communism’ and ‘photograph’. The backs of the photographs are covered with editor’s remarks and filing references which reflect general attitudes to the perceived communist threat, and these have been used for the titles of the paintings. At a time of increasing surveillance and renewed talk of the ‘enemy within’, McCarthyism is a timely reminder of the dangers implicit in the narrowing of political life, and the risks to civil liberties of scapegoating minority groups in society. 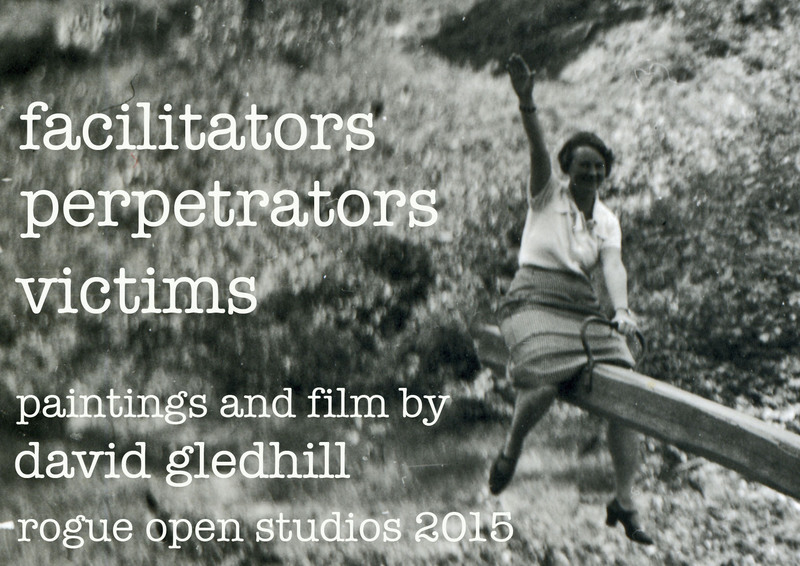 ‘Facilitators, Perpetrators and Victims’ New work by David Gledhill at Rogue Open Studios 24th-25th October 2015. I’ll be exhibiting new paintings and film at this year’s Rogue Open Studios. All are welcome over the weekend of October 24th-25th. See you at the opening party on Friday October 23rd, 6-9pm if you can make it! 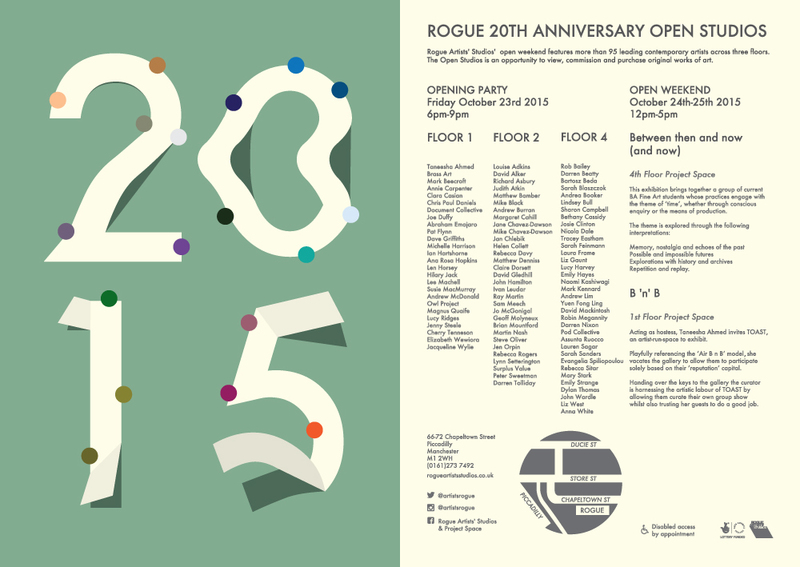 Everyone is welcome to Rogue Artists’ Studios’ 20th anniversary open weekend. The party is on Friday October 23rd, 6-9pm. The studios are open from 12-5pm Saturday 24th and Sunday 25th. We are just behind Piccadilly Railway Station in Manchester, UK. Come and enjoy the work of more than 90 leading contemporary artists on 3 floors of historic Crusader Mill in the heart of Manchester. Entry is free and you can simply talk to the artists, view the work, buy or even commission something if you like! Great building, great art. Don’t miss it! Fabrications at Furniture Makers’ Hall, London. Fabrications July 4th to 11th. Opening times: Sat to Tuesday 12-4pm by appointment only. Email for further information: mikechavezdawson@yahoo.com. It may be the case that artists have been engaging with specific sites, spaces and institutions for decades, but there are nevertheless relatively few instances of group shows that enter into a genuine thematic dialogue with their host venues. Since Marcel Duchamp suspended 1200 coal bags over a stove at the Exposition Internationale du Surrealisme in 1938, the potential to conceive of the space as integral to the work has accumulated an almost irresistible logic, making it seem retrograde to produce work that fits in anywhere. If, as Henri Lefebvre suggests in The Production of Space, artists can reinvest the real with utopian potential through the reappropriation of institutional spaces, then those interested in offering a critique, or indeed, a celebration of social and cultural phenomena seriously hamper themselves by sticking rigidly to the ‘white cube’ formula. Duchamp’s spirit hovers over Fabrications, an exhibition in which Simon Attard, Mike Chavez-Dawson, Rosalind Davis and Brian Reed sustain a material, formal, aesthetic and utilitarian rapport with the modestly stately rooms of the Furniture Maker’s Hall at 12 Austin Friars in London. Chavez-Dawson has forensically researched every component of A Study For Above the Shoulders, sourcing the timber frame that supports a vintage 1940’s chrome light box from a defunct psychiatrist’s office. The result is an eerily disquieting meditation on the science of the creative mind, as manifested in a transparency featuring Rorschach prints of the names of artists who suffered from mental health problems. Herman Rorschach devised his inkblot test in 1921 as a means of diagnosing schizophrenia, and Chavez-Dawson’s work takes what Foucault called a ‘monologue by reason about madness’ and forces it into a confrontation with artistic free association. Rorschach inspired inkblot paintings punctuate the entire show, either clinically box-framed or available to browse on a sideboard that also offers ancient looking furniture catalogues. The opposing forces in this clash of modernist rationality with the mysteries of the unconscious mind exploded in the pre-war avant-gardes, and Duchamp, who claimed to be interested only in ‘man as a brain’ would surely have been delighted to encounter his infamous Fountain reconceived as a bespoke ring in this context. Duchamp’s Ring by Mike Chavez-Dawson, 2013 to 2017, is perfectly in keeping with the re-commodification of the lost ‘original’ urinal as a result of which it seems to pop up in most major public collections. Kleckztale Chairs, a pair of Rorschach patterned 1940’s German cocktail chairs that enhance the consulting room ambience of the ground floor reception at Austin Friars, also provide a bridge to Rosalind Davis’ work. Davis’ paintings cite and improvise on a high modern repertoire of architectural and design forms, adding stitched geometries and broad washes of translucent pigment to conjure a set of complex interior spaces conveying something of the existential doubt that began to infect the modernist project during the post-war period. In the drawers of an elegant desk in the upstairs room, Davis has placed a series of altered photographic reproductions from Lesley Jackson’s Modern British Furniture. Stitched and painted across, these canonical tubular steel and leather chairs are pulled back from their pristine functionalism to a provisional status that simultaneously offers and questions the promise of a plan for living. The use of needlecraft in both the paintings and photographs reinfuses the angular severity of industrialised production methods with a comforting domesticity, reminding the viewer of the quite different principles that informed pre-modern design movements. Entry Point, a steel and thread sculpture suspended in the stairwell, effortlessly achieves a harmony of materials, form and space and evokes approval of the modernist integration of art and life, but elsewhere in Fabrications there is more than enough black humour to suggest that the opposite view may be equally valid. Simon Attard’s paintings, enclosed in antique frames, borrow some of the existential angst of Francis Bacon’s work, re-situating cold war nihilism in a postmodern painterly flux where more or less anything can turn up on the canvas and still acquire weight and depth. Conceived as portraits, they mobilise the broadest range of painterly strategies in an understated commentary on painting both as a process and as a site of signification. Untitled, a small sombre-hued image of a skull is completely convincing as a Bacon, until you realise it’s an overpainted print of Damien Hirst’s For the Love of God. In a marvellously laconic gesture of solidarity, a trio of Attard’s portraits of Picasso, Bacon and Pollock incorporate Chavez-Dawson’s Rorschach’s made from these same artists names. Attard’s paintings take the form of an closely felt communion with his sources of inspiration, acknowledging their signature styles and gravitas without ever falling into pastiche or mockery. With these paintings, Attard realises Bacon’s imperative to ‘deepen the game’ with genuine subtlety. The sense of shared preoccupations worked through without judgement, pulls together what may have seemed a particularly diverse set of artists and at first glance Brian Reed’s found photographs and text pieces appear at something of a tangent to the rest of the show. It becomes clear however, that Reed, like Davis has taken one of the founding technologies of the modern era and retooled it to release an entirely new set of meanings. Like Attard and Chavez-Dawson, Reed holds a productive dialogue with his sources, a set of banal but oddly poignant snapshots developed from discarded negatives, CD’s and passport photographs. These conventional validatory records have a curious finesse and iconic plenitude despite their dubious framing and inauspicious settings. Reed has developed, enlarged and mounted his finds on aluminium and many feature roughly drilled out faces, imbuing them with a blank uniformity entirely consonant with commercial mass manufacture. 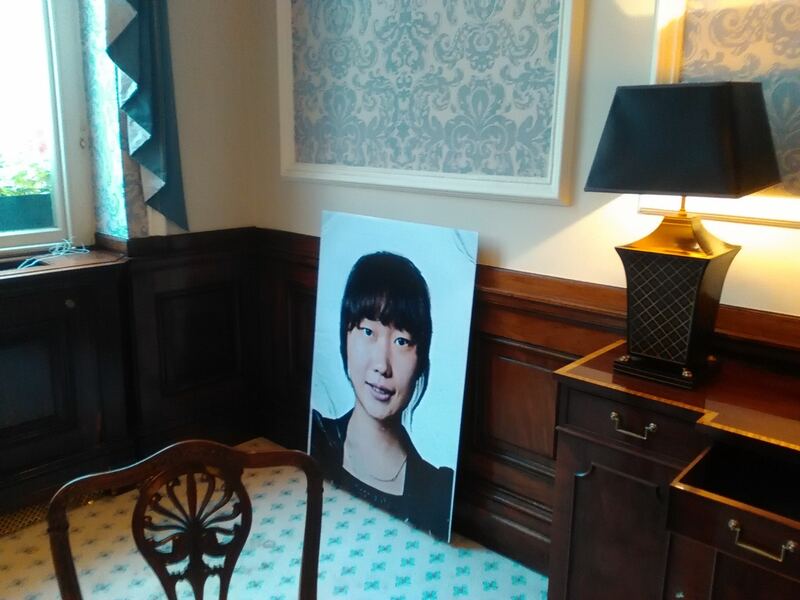 The absence of individuating features isolates the rituals, props and settings of our lives as a set of unfortunate compromises with industrial modernity and yet, in Do Not Become What You See XI, (pictured) Reed preserves the sitter for his blown-up passport photo intact. Subject, like all of us, to the rigid strictures of officialdom, she somehow preserves a spirit of ineffable optimism. Optimism also infuses the wooden text pieces. Excised from 1970s UNESCO policy documents, they memorialise the long last gasp of universal human rights while taking on a new contestatory resonance in austerity Britain. Fabrications persuasively enlists its context in a sophisticated and cross-referenced commentary on the certainties of the modern era and the positivism that drove it ever onwards. It emerges from the encounter with a set of suggestions for further enquiry, suggestions that take account of the social, cultural and political breaches of the past, while providing a tentative sense of what may lie ahead. One of a series of paintings based on photographs in an album found in Frankfurt in 2013. 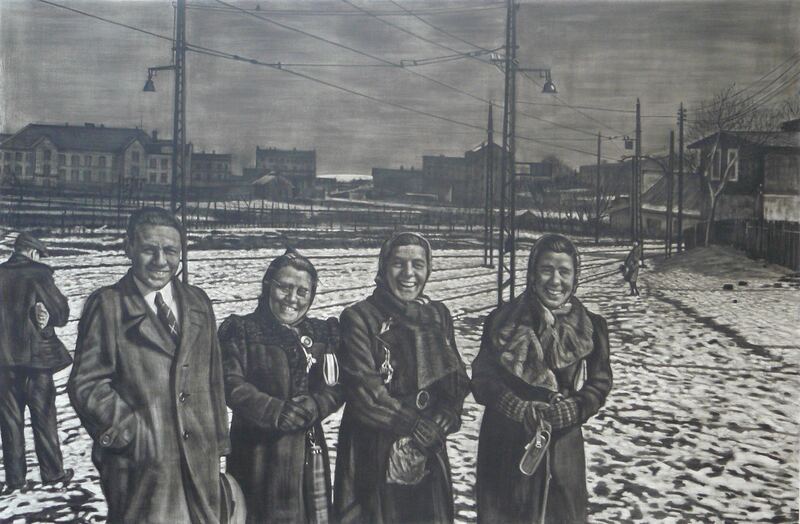 ‘Abordnung’ features paintings from a series entitled ‘Poland 1940-1941’. The paintings are based on snapshots in an album discovered in a Frankfurt flea market in 2013. They appear to show a group of civilian administrators in Sosnowiec in Poland during the Second World War. 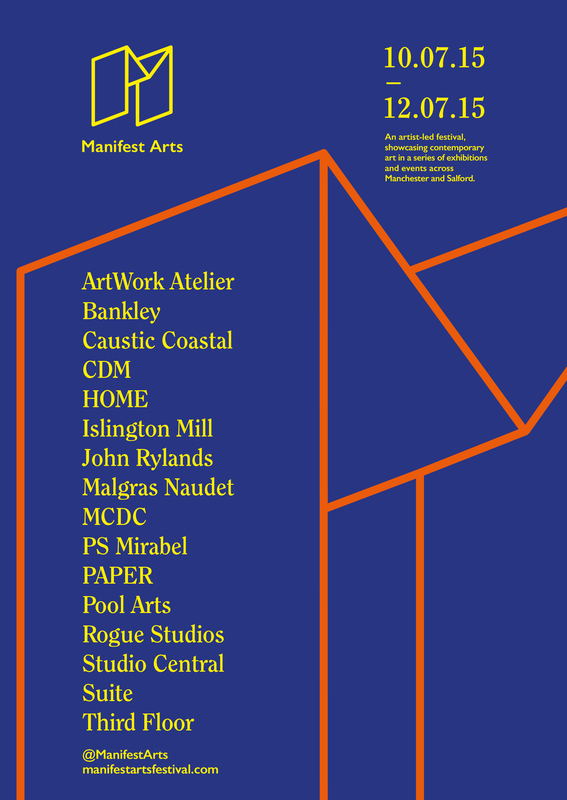 ‘Abordnung’ will be part of the Manifest Arts Festival Rogue Open Studios over the weekend of July 11th and 12th 2015. See www.rogueartistsstudios.co.uk for details.